ONE OF THE MOST remote spots on Earth, the French Southern Territories consists of three groups of islands in the southern INDIAN OCEAN, not too far from the coast of ANTARCTICA, and a thin slice of the Antarctic continent itself, known as Adélie Land. No one lives permanently in these territories, but they are seasonally visited by teams of naturalists and other scientists. 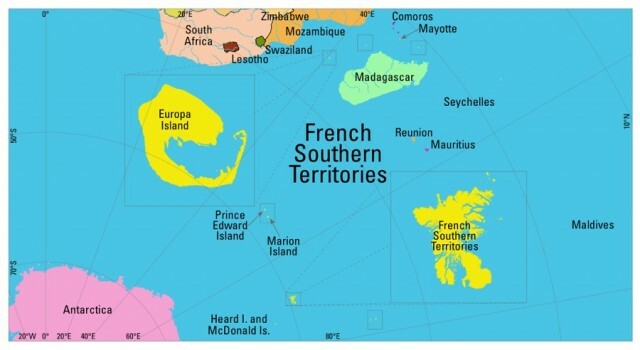 The territory is officially known as the Terres australes et antarctiques françaises (TAAF) and has been an overseas territory of France since 1955 (previously administered as a dependency of the Madagascar colony). The island groups consist of two archipelagos, Crozet Islands and Kerguelen Islands, and two volcanic islands, Amsterdam and Saint-Paul. Kerguelen is formed of about 300 small islands, with a total area of about 2,700 square mi (7,000 square km). The Crozet Islands are smaller in area, with 5 large and 15 smaller islands. Amsterdam covers an area of 23 square mi (60 square km), while nearby Saint-Paul is only about 2.7 square mi (7 square km). All of the islands are volcanic in origin. Adélie Land lies between 136 and 143 degrees E longitude south of the Antarctic Circle and encompasses about 150,000 square mi (389,000 square km), forming a wedge from the South Pole to the sea. The Antarctic Treaty of 1959 declares all of Antarctica to be a neutral zone, but France retains some claims to Adélie Land and maintains a manned research station at Base Dumont d’Urville. The Kerguelen Islands are located approximately 3,300 mi (5,300 km) southeast of South Africa. The largest island in this archipelago is called Kerguelen, or Desolation Island, mountainous and mostly barren. Its coastlines are heavily indented by deep inlets and fjords. The Kerguelens lie atop the submarine Kerguelen-Gaussberg Ridge, which accounts for the islands’ volcanism. Its peaks are volcanoes but are almost entirely covered by glaciers and permanent ice. The climate is among the harshest on the planet, with rain, sleet, or snow almost every day and nearly continuous wind, averaging 68 mi per hour (110 km per hour) year-round, sometimes gusting up to 123 mi per hour (200 km per hour). Kerguelen lies at the Antarctic Convergence, where upwelling cold water from the south mixes with the warmer waters of the Indian Ocean, creating a natural feeding and breeding ground for birds and marine mammals. Like Kerguelen, the Crozet Islands form the abovewater portion of a submarine volcanic plateau, divided into two groups of islands—l’occidental (western) and l’oriental (eastern)—separated by about 60 mi (100 km). The eastern group includes the largest island, Île de la Possession, on which is located the only permanent scientific camp, Alfred-Faure, set up in 1961. There are no natural ports or airstrips. Since 1938, the Crozets have been a national park. The beaches are black volcanic sand, washed down from the islands’ volcanic peaks, the highest being Pic Marion-Dufresne (3,576 ft or 1,090 m). Unlike Kerguelen, these peaks are not covered in ice. The islands of Amsterdam and Saint-Paul are the most northerly of the group and are thus devoid of snow and ice, even in winter. Amsterdam is surrounded by abrupt cliffs, and is the site of a permanent base, Martin de Viviès, where about 20 scientists winter each year. Saint-Paul is characterized by a spectacular central caldera that has been invaded by the sea, delimited by two natural rock jetties. These islands, of very recent formation in geologic terms (within the last 700,000 years), are astride a volcanic hotspot over the spreading Southeast Indian Ridge. The islands’ greater heights (2,907 ft or 881 m maximum) reflect this youthful geologic age, though no volcanic activity has been recorded since the 19th century. All of the islands of the French Southern Territories have large populations of penguin, albatross, and seals. Early-20th-century introductions of rats, cats, rabbits, pigs and goats have now mostly been eradicated but left their mark on this fragile ECOSYSTEM. France declared the largest Exclusive Economic Zone (EEZ) in the world around the Crozets, Kerguelen, and Amsterdam-Saint-Paul in 1978 to stop overfishing (principally of the Patagonian toothfish). This EEZ is patrolled by the French navy and Greenpeace.